Knock 'em dead with these four stylish silicone skulls. 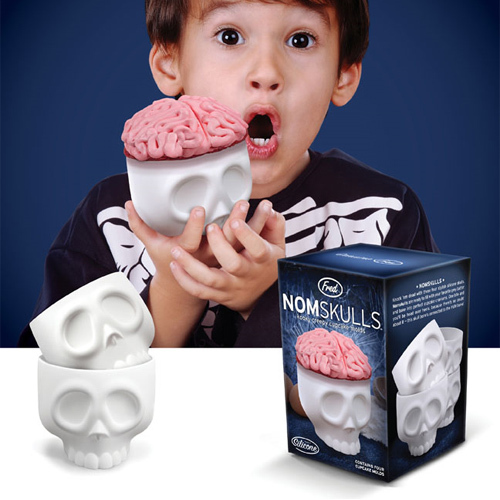 Nomskulls are ready to fill with your favorite grey batter and bake into perfect cupcake craniums. One bite and you'll be head over heels, because there's no doubt about it â€” this skull bone's connected to the YUM bone! We've packed four silicone skull molds in each printed giftbox. Add confectioners' sugar to the frosting until it's stiff enough to hold its form, yet still soft enough to pipe. To the frosting add food coloring(s) to reach desired color. If your cupcakes aren't dome shaped, pile on a small mound of frosting first. Then pipe two lines down the center of the cupcake. Finally, pipe a squiggly pile of frosting onto each "hemisphere".